We are pleased to announce that the Hicks Lodge Cycle Centre project completed by Robert Woodhead has achieved BREEAM* Excellent with a score of 74%. 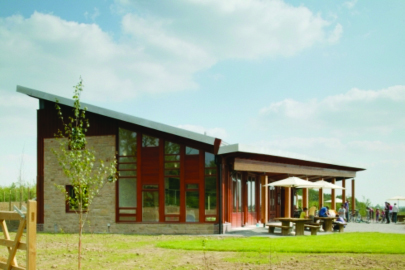 Furthermore Hicks Lodge is the first visitor centre to achieve BREEAM Excellent. Robert Woodhead, in conjunction with Pick Everard Architects, was aiming for BREEAM Excellent for the Hicks Lodge development. Utilising sustainable timber throughout, solar panels, a biomass boiler, a sustainable urban drainage (SUD) system in an airtight structure, were all design elements which made a significant contribution to sustainable development principles. The BREEAM Excellent achievement was further helped by the Post-Construction Energy Performance Certificate for Hicks Lodge achieved an ‘A Ratings’. Robert Woodhead’s aimed to achieve a good rating for energy performance and the exceptional air tightness of the building, as well as the materials used for construction and the design itself helped enable this.